Scott Ian is back once again as a published author. His first book (I’m The Man) took us through the transitions of his bandmates in ANTHRAX, and also gave us a glance behind the scenes of the music industry that can be anything but normal. 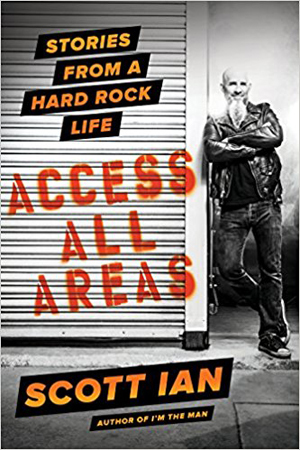 This time, in his second foray into writing he brings us captivating tales of life on the road in Access All Areas: Stories From A Hard Rock Life. This book is filled with personal and hilarious stories that seem to pursue Scott through his journey in life. From bizarre occurrences with fans who think it is ok to touch or 'may I say pet' his famous long goatee to a fun filled night of booze and jamming with METALLICA at Kirk Hammett’s house. There is a lot of information I’m leaving out of that Kirk Hammett story so you can experience this fun anecdote yourself. One of my favorite stories that Scott expresses to us is about his childhood involving his first concert without adult supervision and heading to Madison Square Garden to see KISS with his friends. I have never been to New York City, however after hearing Scott explain with tremendous detail and with his great unique humor about the concert and the journey to the big city I feel like I have in my mind. Just meet me under Ace Frehley! Go pick up the book and you will understand. I love when rock stars share their childhood memories. This is where you find out they are very similar to you and I. Sometimes we forget how akin they are to us because we put them on such a high pedestal. Scott’s playfulness in his words and descriptions make this book just an overall fun and enjoyable read. You will feel like you are best friends with him and are just bullshitting at the bar having a nice cold one. He has a great sense of humor whether it is him joking around with a celebrity or poking fun at himself. This is a book for anyone whether you know who Scott is or not. They’re just amusing, readable stories that had me laughing out loud and regurgitating them to my friends.